How can cloud services be protected against denial-of-service attacks? Cloud denial-of-service (DoS) attacks are multifaceted and prevent consumers of cloud services from accessing their cloud resources. A cloud DoS protection service is incorporated into the security architecture to shield the cloud provider from DoS attacks. 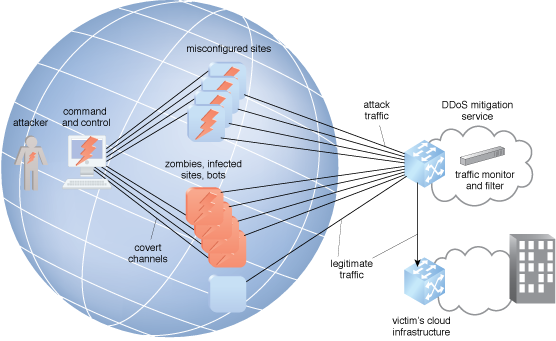 A network DoS protection service updates the domain name service (DNS) to route all cloud provider traffic through the protection service, which filters attack traffic and routes only legitimate traffic to the cloud provider. Alternately, the cloud provider can route traffic to a DoS protection service when experiencing an attack, or create their own DoS protection service. The DDoS mitigation service in action.